Updated April 3, 2019 : We spiffed up this post to make it sparkle. No changes to the original recipe. The cream cheese frosting recipe can be cut in half if you prefer less frosting. If so, apply sparingly so there is enough to cover the entire cake. Feel free to use any favorite liquor, such as Grand Marnier, Triple Sec, Cognac, Armagnac, Brandy or even Bourbon. Or, simply omit the liquor and use 2 tsp vanilla extract. 1 Preheat the oven to 350° F. Butter and flour three 9-inch round cake pans. 2 Whisk together dry ingredients: In a large bowl, vigorously whisk together the dry ingredients: flour, baking soda, baking powder, salt, cinnamon, and nutmeg (optional). 3 Whisk together oil, sugar, eggs, then stir in pineapple, bananas, vanilla, 1 cup of pecans: In a separate bowl, whisk the canola oil, sugar, and eggs together until combined. Stir the pineapple, bananas, vanilla and one cup of the chopped pecans into the egg mixture and mix (do not beat). 4 Fold wet ingredients into dry: Using a wooden spoon or spatula, fold the wet ingredients into the dry ingredients until just combined (do not over-mix). 5 Pour into cake pans and bake: Pour the batter into the three prepared cake pans, taking care to divide evenly. Bake at 350°F on center racks of oven for 20 to 25 minutes, or until a toothpick or knife inserted in the center comes out clean. 6 Cool: Allow the cakes to cool in the pan on wire racks for 10 minutes. After 10 minutes, run a knife around the edges and remove the cakes from the pans. Cool completely on wire racks before frosting. 7 Make the frosting: Beat the softened butter and cream cheese in a large bowl with an electric mixer. With the mixer on low speed, add the powdered sugar in small amounts until all is incorporated, then add the Cointreau and vanilla and beat until the frosting is light and fluffy. 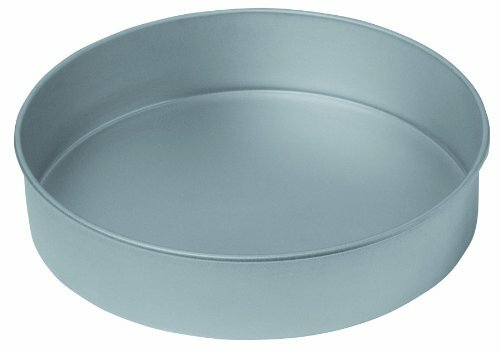 8 Frost the cake: Place one layer, top down, on a large plate or cake stand (this creates a smooth surface on the top and results in a more level cake). Spread frosting evenly over the first layer, then repeat with the second and third layers, then frost the sides. 3 Sprinkle with chopped pecans: Sprinkle the top completely with the remaining cup of chopped pecans (toasted or un-toasted). Alternatively, press the chopped pecans onto the sides of the cake and leave the top simply frosted. This cake is best served the day it's made and can be kept, assembled and frosted, for a few hours before servings. If you need to serve it the next day or if you have leftovers, cover the cake as well as possible and refrigerate it. Remove it from the fridge and let it come up to room temperature for an hour or two before serving. Hello! All photos and content are copyright protected. Please do not use our photos without prior written permission. If you wish to republish this recipe, please rewrite the recipe in your own unique words and link back to Hummingbird Cake on Simply Recipes. Thank you! I made this cake and WOW! Excellent instructions and an obvious fool-proof cake came out perfectly. I had a lot of icing left over. This cake a real crowd-pleaser. Tremendous flavors. Can freeze extra icing if desired for use later with cup cakes. Thank you so very much for this receipe!!! Would like to have seen what inside of the cake looks like! Hi Debbi May. If you look at the method step that shows the assembly, you can get a little sense of how the layers will look. Thanks for your comment. I have a nut- allergy child. Ugh. Can toasted coconut be used instead of pecans? Hi, Patricia! Sure, I think that it would work just fine to substitute toasted coconut for the pecans. Enjoy! I’m sorry I’ve tried looking through comments for cupcake variation and baking time but haven’t found it. Anyone that can help me? Hi, Dynah. The same recipe works for cupcakes as it does for the cake, however you’ll want to cut the icing recipe in half (and you still might have some leftover). The baking time will depend on the size of cupcake tin you use. If you use normal sized cupcake tins, the bake time should be roughly the same as the cake (25-30 minutes) – just keep an eye on them and check with a toothpick to see if they are done. The toothpick when inserted will come out clean when they’re done. Enjoy! Shirley, I honestly don’t know as I’ve not tried baking this recipe in a bundt cake pan. The cake recipe converts very easily from sheet cake to cupcakes, so I would guess it would work. If you try it, then you’ll want to cut the icing recipe in half since it’s intended for multiple layers of cake. You’ll also want to pay close attention to the baking time and check to see that the cake is cooked all the way through since a bundt pan is deeper than cupcakes or sheet cake pans. Please let us know how it works out! I would like to make this a two layer cake and wonder how much the batter would rise? I was thinking of filling two 9″ pans to 2/3 full and increase the baking time. Any advice would be appreciated. Thanks! I made this cake when my inlaws came and it was such a hit, I decided to make it again for our county fair last week. I took first place in my class. Thank you so much for this wonderful recipe! I’m a 66 year old man who has just now learned to cook. My Sainted Mother is 90, and can no longer cook for herself. Although I am new at this, I found a recipe for this Hummingbird Cake on the Internet. It sounded good since I even put pineapple in my cole slaw. Well, I’ll have to say, without a doubt, this is the best cake that has ever crossed my lips. And I made it! Simply wonderful. Hi, Anna. I haven’t tried making it that far ahead of time before serving. A day ahead is certainly fine, so two days might be. One thing to considert is that the cake will absorb any odors from your fridge if the seal around the cake isn’t really good. If you try making it that far ahead of time, please let us know how it works out! Easter Sunday is my husband’s 60th birthday and he loves carrot cake. But then I came across this recipe and want to try this instead. I’d read a comment somewhere about someone adding grated carrots and coconut to it and reducing the amount of banana…have you heard this…any thoughts…proportions? Can’t wait to make this! I’m guessing that yes, it would be just fine without nuts, although lacking the texture. You might consider adding some dried fruit instead. If you try it, please let us know how it works out! I used unsweetened coconut shreds and it turned out beautiful. (Just make sure they are not manufactured on equipment possibly used for nuts. It will say in engredients list) My daughters best friend has a tree nut allergy, so we have to be extra careful. Yes. i made the cake and forgot to add the nuts to the batter. It was great and everyone loved it. Made this cake for my son’s birthday. He’s not a fan of cream cheese, so I substituted my favorite vanilla icing for the layers, and my favorite dark chocolate icing for the outside. The cake got rave reviews from everyone who tried it. It’s a keeper. Could I make this in a 9×13 pan?? I’m guessing that yes, you could make this in a 9×13 pan. You may need to increase the cooking time by a few minutes. How much longer, your guess is as good as mine. If you make it in a 9×13 pan, please let us know what you did and how it worked out for you! Hi Lynn, I haven’t tried making this cake in a 9X13″ pan. If you do, you might want to make two layers instead of three and increase the cook time, as Elise suggested. Please do let us know how it works out! This cake looks amazing! Cannot wait to try it! So far this summer I’ve baked Suzanne’s Chocolate Cake and made the Orange Curd Cake twice and so far all of my cakes tend to lean like the tower of Piza- but amazing and delicious non-the-less . Any tips on how to keep the layers plumb? I followed the layering noted in the Orange Curd recipe with each cake but they still look a bit wonky. this recipe was easy and is one if not my favorite.I am turning 55yrs old and my 4yr old grandaughter help my measure and mix and then frost it and we had a blast. I would say to you all (make it) and enjoy. John Fleshman. Phx AZ. This is such a FANTASTIC recipe!!!! I’ve made it 3 times and have gotten rave results and had the cake completely finished…crumbs and all!!! The only edible flowers I could find were marigolds, but I added a special touch by stenciling a hummingbird silhouette with colored sugar on top. I’ve done this as a sheet cake with extra frosting on the side for people to add another dollop of sweetness. Also…I added a bit of banana INTO the frosting. Awesome, awesome, awesome recipe!!!!! can anyone recommend a pineapple substitution (need one due to allergy)? is so, is this a sub you’ve tried? thanks! Chetna, just curious as to the size sheet cake pan this 3 layer makes. I have never tried a 3 layer cake, don’t even have 3 round pans, haha. Would love to try this cake this week Thank you!. Steve-Anna, again thank you for the cupcake version of this delicious cake. I used the cream cheese frosting recipe for the cake but the cupcakes are yummy all by themselves. They are going to be a big hit for my friend’s graduation and birthday celebrations. The cupcake recipe yields 36 regular size cupcakes. Julie, thank you so much for letting us know how the cupcakes worked out. Enjoy your upcoming celebrations! I was wondering if you could halve the cake recipe and bake as cupcakes? Any alterations for changing recipe from cake to cupcakes, ie: baking time? Thank you so much for the link and quick reply. I’ll be baking them this week and will let you know. I have made humming bird cake mixture into cupcakes works out great. I add 1 cup of blended cherries for little more color, it adds a great taste also. I volunteer in Nursing Homes . (which I may say I love being a part in their beautiful lives.) so many are diabetic.If I use splendor sugar, do I use the same amount as sugar? Hope some one will let me know thanks Joyce Collins of Corsicana , Tex.